Why Is Creatine Level Important for a Brain MRI? 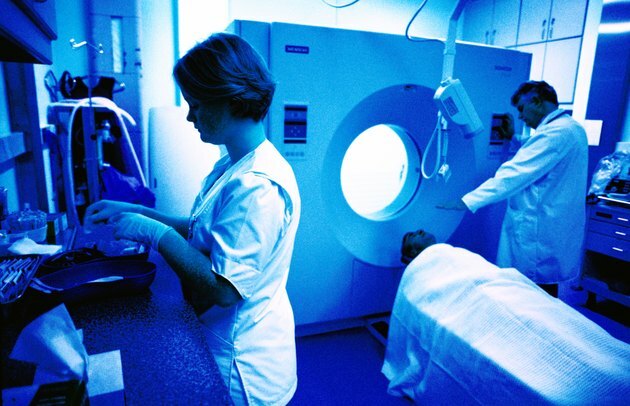 Magnetic resonance imaging is a test that uses a computer to produce very detailed pictures of body structure to help diagnose various diseases and medical conditions. MRIs are not X-rays and do not use radiation. A serum creatinine is a lab test that may be done to measure kidney function before an MRI is performed. An MRI provides detailed images of any part of the body. It uses a powerful magnetic field and radio frequency pulses to create pictures on a computer. The pictures can then be examined, transmitted electronically, printed or copied to a CD. A variation of the MRI, functional MRI, can actually measure the tiny metabolic changes that occur in the brain. An MRI can examine the anatomy of the brain, monitor growth of brain tumors, help with the planning for brain surgery or radiation therapy and allow an evaluation of various brain functions. MRIs are sometimes done with a contrast material to help certain areas of the brain show up better on the pictures. The material most commonly used is gadolinium. It may be given by mouth or injected into the blood stream. Gadolinium can cause problems for people with kidney disease. There is a rare complication of MRIs called nephrogenic systemic fibrosis that is believed to be caused by high doses of gadolinium in people with very poor kidney function. The creatinine test is a measure of kidney function. A serum creatinine is a test for the amount of creatinine in your blood. Your serum creatinine may increase if you are dehydrated, taking certain medications or use creatinine as a dietary supplement. According to the Mayo Clinic, normal creatinine is 53 to 106 micromoles per liter, although this can vary from lab to lab, between men and women and with age. A high creatinine test means that your kidneys are not working very well, and a urine creatinine test may then be performed to determine if you actually have kidney failure. Although the brain MRI is a relatively safe procedure, when gadolinium is used, there is an increased risk for people who have kidney disease. The creatinine test helps to determine who is at higher risk so precautions can be taken. According to Dr. Carl Anderson of the Mayo Clinic, your physician may decide not to use gadolinium, may use a lower dose or may order immediate kidney dialysis after the MRI. If you have questions or concerns about MRIs or gadolinium, talk to a health-care professional.